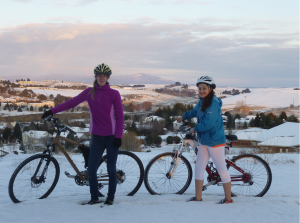 Jaime Brush with Isabella on a snowy bike ride, with Moscow Mountain in the background. An Advocate’s Voice: Washington Bikes member Jaime Brush speaks up for the interests of people who bike in Pullman in many ways. She provided this update on her efforts, which demonstrate that stepping up and speaking up can make a real difference in your town. For a town built on a topography of rolling hills, Pullman has made a big step in the direction of becoming a bicycle friendly community! Starting at the end of 2013 and the beginning of 2014, Mayor Glenn Johnson asked community members and organizations to submit suggestions for the City of Pullman and City Council to consider adopting. Having stirred up quite the attention around biking in Pullman, I couldn’t wait to read through all the submissions to see if any were bike-related. 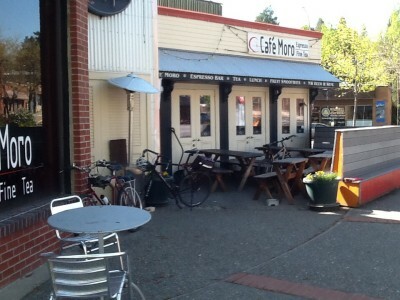 Bikes outside Cafe Moro in downtown Pullman illustrate the need for bike parking. After reading through a binder full of suggestions, I was most surprised and happy with the one from the Pullman School Board and the Superintendent of Pullman Schools (see An Advocate’s Voice Parts I and II for the background story; Part III is still in the making). 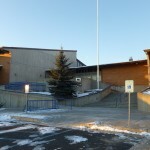 Their one suggestion acknowledged the difficulty in reaching Pullman High School from downtown by biking or walking and requested that more walk/bike paths be provided to improve the connections. Throughout the submissions, there was a clear emphasis on the theme of having walk/bike connections to Pullman High School. The Pullman Civic Trust listed this as their #1 suggestion, in addition to several other bike and trail-related goals. The League of Women Voters asked for walk/bike paths where cul-de-sacs are permitted. 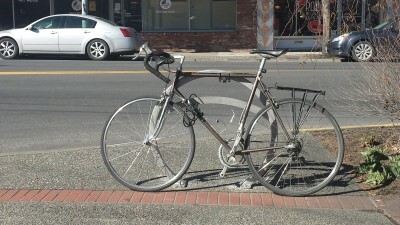 The Pullman Chamber of Commerce advocated for more bike infrastructure throughout Pullman, specifically downtown bike parking. A few weeks later, city department heads gave their input on the 15 proposed goals. The Superintendent of the Pullman Parks Department, Alan Davis, recommended changing the wording in the goal from creating bike parking in three distinct downtown locations to, instead, creating bike parking throughout the “downtown corridor.” This slight change in wording allows for input from the new Pullman Bicycle Task Force and citizens as to where the racks/lockers should be installed. 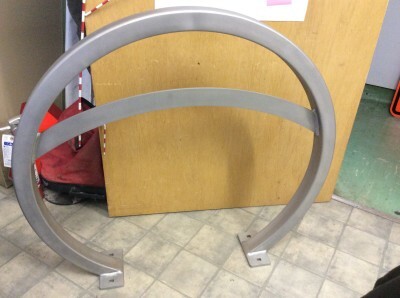 After all, placing the new bike racks at destinations for people on bikes is key to the racks’ success. Improve bicycle and pedestrian trails. Explore the implementation of appropriate recommendations in the WSU Bicycle and Pedestrian Plan. Enhance bicycle parking in the downtown corridor by installing bicycle racks, and possibly bicycle containers, at strategic locations. 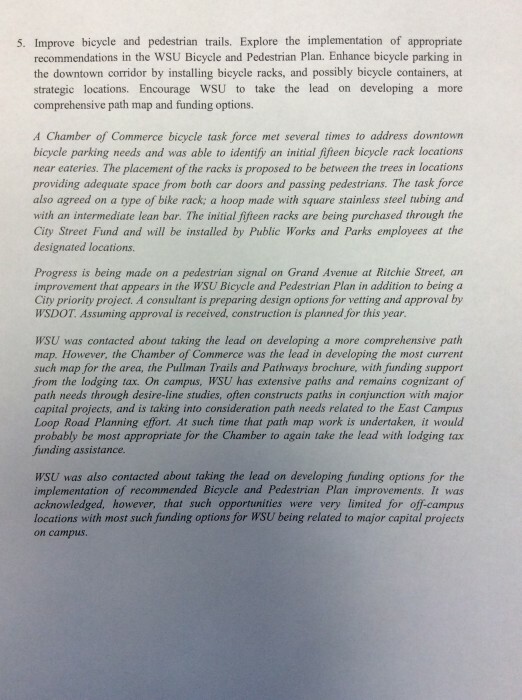 Encourage WSU to take the lead on developing a more comprehensive path map and funding options. The page from the 2014 goals adopted by the City of Pullman showing Goal 5, Biking and Walking. The next step in the process was deciding where the bicycle racks we’re going to be placed. The Pullman Bicycle Task Force was created. After several meetings and following the recommendations put out by the Association of Pedestrian and Bicycle Professionals in their Bicycle Parking Guidelines 2nd Edition, the Task Force was ready to give their siting recommendations to the City of Pullman. Sportworks, a Washington-based company that designs and manufactures bicycle products, specifically bike parking and transit racks, was able to provide Pullman with a custom-designed rack that mimics the rolling hills of the Palouse area. This initial stage of installing bicycle parking around the city of Pullman has began and is already a success! In conjunction with bike parking, an bicycle/pedestrian educational campaign is being developed; I’m working on it with the Pullman Police Department with the direction and help of Washington Bikes. Why is bicycle parking important, anyway? Bicycle parking is good for business! Designated, well-designated parking promotes a more orderly streetscape and preserves the pedestrian right of way. Bicycle parking helps legitimize cycling as a transportation mode by providing parking opportunities equal to motorized modes. Shoutout to Jaime for her tireless work to grow bicycling in Pullman. She also got Pullman added to the annual statewide bike/pedestrian count. Steps like these make a real difference. What’s happening for better bicycling in your hometown? We’d like to share your advocate’s voice. Comment here, email your story with pictures to info@wabikes.org, or let us know if you’d like us to interview you and write the story. 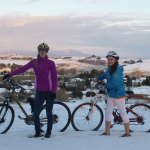 Biking in Pullman, Part II: Will Isabella Attend a Bike-Friendly High School? 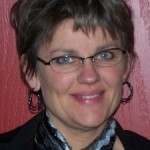 This article was posted in Advocacy, News, Whitman County. Bookmark the permalink. Follow comments with the RSS feed for this post. Both comments and trackbacks are closed. Bicycle parking is necessary in every city around the world to keep the streets in order. This will promote easy strolling around the city and avoid accidents.